The town of Nerima, Tokyo, where I live for seven years, is home to Japanese animation, or anime. Nerima has had one of the biggest anime studios, Toei Animation Company, as well as more than 90 intensive anime-related companies since Japan’s first anime film was aired in 1958. World’s famous animes such as Dragon Ball series, One Piece, Teenage Mutant Ninja Turtles, and Sailor Moon series, has been created in this place. The Nerima Ward government hosted today an anime festival, Neritan Anime Project in Oizumi, around Oizumi Gakuen station of Seibu Railway, to which Toei Animation Company is close. Leiji Matsumoto, one of Japan’s famous manga-anime artists and a resident of the Oizumi neighborhood, was invited to the festival. One of his works, the Galaxy Express 999, was a great anime series popular among many Japanese kids in 1980s. For those of you who don’t know this manga, the story of it is set in a space-faring, high-tech future, where mechanized people with “machine bodies” are pushing humanity towards irrelevance and extinction. A street urchin, Tetsuro, wants an indestructible machine body, giving him the ability to live forever. While machine bodies are expensive, they are supposedly given away for free on the planet Andromeda, the end of the line for the space train Galaxy Express 999. He meets up with a beautiful woman, Maetel, who is the spitting image of his dead mother. Maetel offers him passage on 999 if he will be her traveling companion. Tetsuro agrees. Another notable character is the strict, mysterious alien conductor, that sometimes gets involved in Tetsuro and Maetel’s adventures. (See Wikipedia) The Galaxy Express 999 was first published in 1978, so this year is the 30th anniversary. 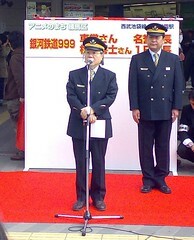 Today Matsumoto was appointed a “one-day station master” of Oizumi Gakuen station. He settled near the station when he was 25 years old, and created the wonderful manga and anime works in Oizumi. The ward government and the Seibu Railway company granted such a honorary position on him for his long-year contribution to this neighborhood. 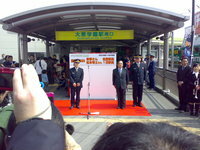 He said through his speech, that his habitation in the Oizumi neighborhood was destiny. When he came to Tokyo from his birthplace, Fukuoka, he just “happened to” start living there. One day when he walked around his house he found a former resident of Tomitaro Makino, a Japan’s well-known botanist. At that time he began his manga artist career through his first work focusing on entomology. Matsumoto felt as if he had been lead to live near Makino, as a person working with wildlife. When it comes to destiny, I happened to begin reading his Galaxy Express 999 comic books just two weeks ago as well as Emma, when I did not know about this festival. I think that perhaps it is also destiny that I read this comic these days and come to the festival today. Anime is now not only a maniac hobby by otakus, geeks or nerds, but is one of Japan’s important industries today. As Japan’s economy has been in recession for many decades and its technology is becoming less cost-effective, anime industry may be a great messiah for the future Japanese people. Some of the pictures are uploaded on Flickr.